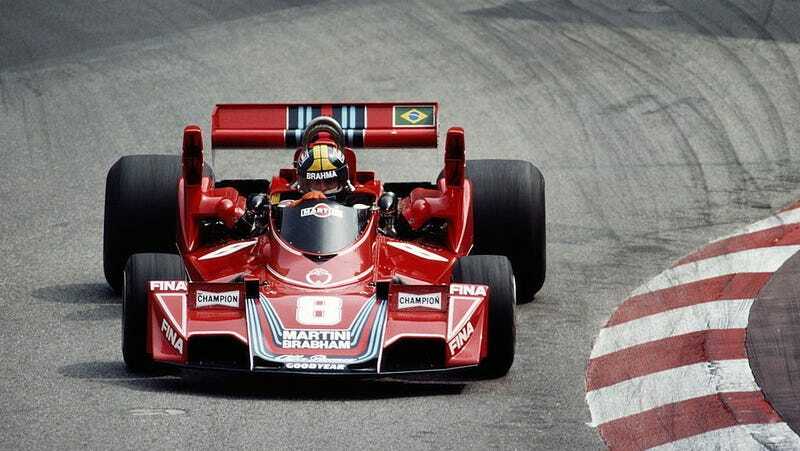 Carlos Pace drives the #8 Martini Racing Brabham Alfa Romeo BT45 during the Grand Prix of Monaco on 30 May 1976 on the streets of Monaco. Few car companies have more motorsports history than Alfa Romeo. Enzo Ferrari actually got his start running its racing team in the 1930s, and even today Ferrari’s Formula One cars still carry the Alfa logo. But for more than 30 years now, Alfa’s been absent from the top tier of open-wheel racing. That’s kind of sad! But it changes next year with the Alfa Romeo Sauber F1 Team. Formula One announced this morning that Alfa’s coming back to the series for the first time since the mid-1980s. Now, Swiss team Sauber will run a “multi-year technical and commercial partnership” with the brand that includes operating with 2018-spec Ferrari engines. Appropriate. No drivers have been officially announced, but Charles Leclerc is expected to have one of the seats, and the BBC says the other one should be filled by Marcus Ericsson or Ferrari third-chair Antonio Giovinazzi. Alfa Romeo has been in F1 off and on for decades now, with achievements ranging from winning the inaugural World Championship of Drivers in 1950 to serving as an engine supplier for several teams from 1961 until 1979. After that it had a works team that ran until 1985.